Since then I invited him to join me onstage at Falcon Ridge, and we entered a fiddle contest (and won), and have another scheduled for September. 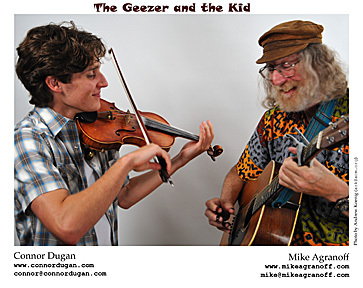 So I booked the two of us to do an opening act at the Minstrel under the band name "The Geezer and the Kid". (I can do that. I sleep with the guy who books the place.) We'll be doing a mixture of tunes and songs, and we'll throw in the Bach Double as an extra treat. The feature act that evening is Brian McNeill, a powerhouse multi-instrumentalist and songwriter, who for decades was the central figure of the great Scottish supergroup, the Battlefield Band. This ought to be a really good show. I just found out today that I will be playing the Falcon Ridge Folk Festival this year. I've been after this one for probably 20 years, and seriously chasing it since 2007. The Festival's Program Director, Anne Saunders has always told me that she admires my work. But she said that she really had to pay heed to the Festival surveys, where my name never really held great weight. I understood and sympathized with her position, but kept on plugging. Then back in 2007 I did a showcase at NERFA which brought the house down. I took advantage of that performance by buttonholing Anne and saying to her, "You are in a rare position for one who books a folk venue. You have a guaranteed audience. You know you can please them by giving them the performers they've asked for in their surveys. But you can also present them with a "dark horse" act that they don't know, but that you know will knock their socks off. I think I just proved that I'm that act." She said, "Yes you did." Since that time I've been applying to perform there with some actual hope of getting the gig. And it just today came to pass. I'm real pleased! I'll post my performance schedule when I know it. On the other hand, the second biggie dropped on me out of the blue. At the Folk Alliance Convention in February, I ran into Mitch Podolak. We've been aware of each other at a distance by reading each others posts on a number of listserves we both contribute to. He's quite a mover-and-shaker in the Canadian folk scene. He founded and ran the Winnepeg Folk Festival for many years. His latest project is something called "Home Routes" wherein he schedules performers on concentrated tours of house concerts throughout Canada. I'd not heard of this project before the Conference. But after seeing some of my work, he offered me one of those tours. So I will be playing 12 concerts in two weeks starting on April 2, 2011. That will be my most concentrated and longest tour I've ever done. I'm ready. I have a Performance Alley Showcase at Folk Alliance in February. That's a pretty big deal. The Folk Alliance is an international organization of almost 3000 folk performers, presenters, journalists and other associated hangers-on. Its purpose is to promote the music and its practitioners, and its national conference in Memphis every February draws about 2000 attendees. There are workshops, panels, classes, an exhibit hall, but mostly showcases. Performance Alley showcases are juried, and scheduled with nothing happening opposite them. There are also privately run showcases and "guerrilla" showcases held into the wee hours in the hotel rooms of the attendees. I've attended the Northeast Regional Conference every year for a decade or so, and was awarded showcases in 2001 and 2007. They've been quite beneficial to me in getting me known by the presenters of concert series and festivals. However, I've been reluctant to consider going to the International Conference in Memphis for a number of reasons. -- It's much more expensive than the regional, even discounting travel expenses. -- The travel expenses are not inconsequential. I can drive to the Regional in a couple of hours, but it would eat up two vacation days to drive to Memphis, and even then it would be gruelling. -- The International is almost a full week long as opposed to the 3 days for the Regional. More vacation days. -- And the benefit for me would be questionable. Sure, I would be exposed to a lot more potential bookers, but it would be difficult for me to take advantage of gig offers in Idaho and Louisiana, since I'm primarily a regional performer. So I never really gave it much consideration until Andy Cohen, a blues guitarist and ethnomusicologist made me an offer I couldn't refuse last July. He was given charge of a Traditional Track at the Convention to promote that branch of the music. (He considers it the only branch of folk music, but that's a subject for another book.) And Andy offered me a full scholarship to the Convention to take part in that track. Plus an ex housemate, Mike Cannito, offered me a place to stay in Memphis for the week. Very tempting. There were still the other factors to consider, so I made Andy a deal. I told him I would apply for a Showcase, and if I got it, I would come. When the list of Showcasers was announced back at the end of November, the verdict was that I was on Standby. that meant I was on a list of alternates in case some folks who were offered turned them down. That was to have been decided by the end of 2009. And when I was still not on the list at the beginning of January, I reluctantly told Andy I couldn't do it. A couple of days later, word came that Joel Mabus had to back out because of a death in the family, and I was offered his slot. Helluva way to get the showcase, but here I am. So I am frantically boning up on some traditional material, getting promo packets assembled, compiling lists of people whose arms to twist to come see me play, and in general being busier than a two-peckered rabbit. So if anyone is headed down to Memphis on February 17-21, here are my showcases so far. I hope you can make them. Wednesday, Feb. 17, 1:00-5:00 PM, Natchez Room: Folk University. This will be a presentation / performance of several presenters on the subject of the continuity between Folk Music in its academic definition and the music the rest of the world labels as "folk". My segment will be around 2:30 PM. This looks to be a fascinating lecture, and the lineup is stellar. Thursday, Feb. 18, 10:00 PM, Knoxville Room: Performance Alley Showcase. Friday night / Saturday morning, Feb. 19, 1:00 AM, Room 1904: The 800 Pound Guerrilla Showcase. Mike Agranoff © 2013. All Rights Reserved.